For a while, keywords were one of a content marketer’s only tools for getting their content in front of their target audiences. But then, hashtags exploded on the scene with some help from Twitter, and now entire marketing strategies are often developed around these terms. Does that mean keyword use is a long-gone tactic, only to be replaced by hashtag marketing? Certainly not. In fact, there is a symbiotic relationship between keywords and hashtags, and knowing their differences and similarities can help you create successful content marketing strategies that effectively reach your prospects. Hashtag marketing is still relatively new, but its use has significantly grown in recent years. Mainly seen on social media sites, hashtags help you promote your content on these platforms, and get it in front of prospects who may not have otherwise known about your brand. Hashtags are also excellent tools for increasing engagement. Instagram posts that include at least one hashtag have 13 percent higher engagement than those without. Chances are you’ve participated in, or have been aware of, successful hashtag campaigns from many companies. Remember Coca-Cola’s #ShareACoke strategy? It alone received 160,000 mentions on Twitter and 740 million impressions. Or how about the #RedCups from Starbucks that featured 13 customer-designed cups, and encouraged followers to share their own #RedCups designs on social media. The results from using hashtags are usually short lived, but extremely effective for that small period of time. That’s just the nature of posting content on social channels where trends come and go overnight. But don’t think about hashtags living in a silo of content marketing. Once your content is put in front of new prospects with a properly timed hashtag, the focus moves from engagement to conversion, and that’s where keywords come in. Keywords are some of the most vital components of content marketing. When coupled with quality writing and enticing visuals, keywords help drive traffic to your content. Although hashtag marketing and other methods have come to the forefront in recent years, solid keyword use still remains one of the best ways to improve SEO and rank better on SERPs. Psst… Want to learn more about the top SEO tactics of 2017? Check out our new eBook. But, all said, the benefits of keywords are longer lasting than those of hashtags. Using pertinent, relevant and highly targeted keywords throughout your website, landing pages and blog content allows your brand to build a reputation with Google and establish trust with your audience. It’s crucial to note that your content’s relevance to keywords is important in that regard. So don’t stuff a blog post or landing page full of keywords to earn Google’s “trust.” Focus on delivering content that meets your ideal audience’s needs. While they are different from each other, the truth is that keywords and hashtags share similarities as well. On their respective channels, they are successful tools for getting your brand in front of prospects and boosting organic traffic. Whether it’s searching for a specific hashtag on a social network, or typing in a phrase in a search engine, if you’re using targeted words and phrases correctly, your posts and content will be put in front of potential leads. Additionally, conducting research and analysis on hashtags can help inform your keyword strategy, and vice versa. For example, by looking into trending hashtags, you can identify some popular keywords and topics for blog posts. Then, you can share that content with those hashtags for an extra boost in visibility. 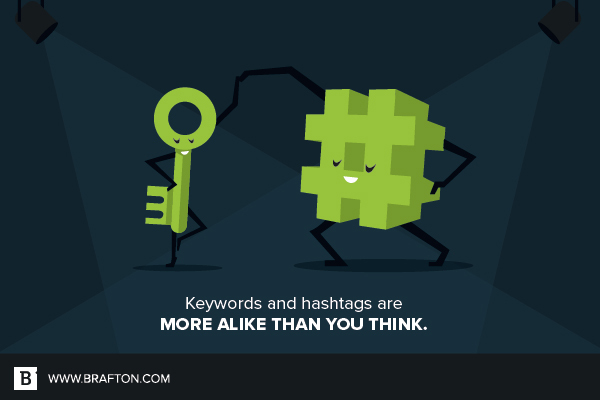 Keywords and hashtags are effective tools for marketers, both in different and similar ways. Knowing the relationship these terms share can help you create better content marketing strategies.